The GMC Syclone was the first production truck to have 4 wheel Anti-lock brakes. By today's standards it's a fairly bulky, primitive, and error prone system. Many Syclone and Typhoon owners have grown tired of the aging or failing systems in their vehicles and opted to remove the ABS rather then face steep replacement costs. 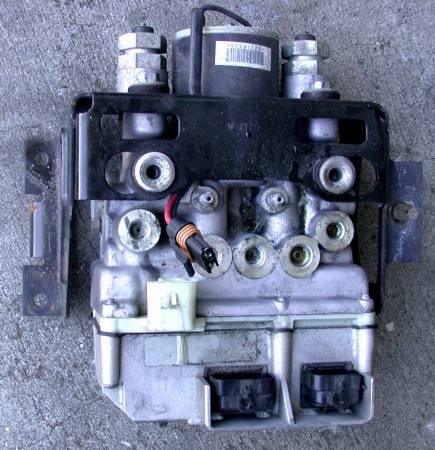 This little article will cover the steps required to remove the ABS module from the truck. Usually this results in more predictable braking and a better pedal feel. In some cases the ABS units have been known to actually increase braking distance when their primitive design misinterpreted wheel sensor input as skidding. That said, I'm sure they have also prevented a quite few accidents. Verify that removing the ABS from your vehicle is legal in your state before you begin. Also be warned, this procedure involves modifying the most important aspect of your vehicle, the brake system. Make sure you double check all modifications and test in safe conditions before risking anyone's safety. 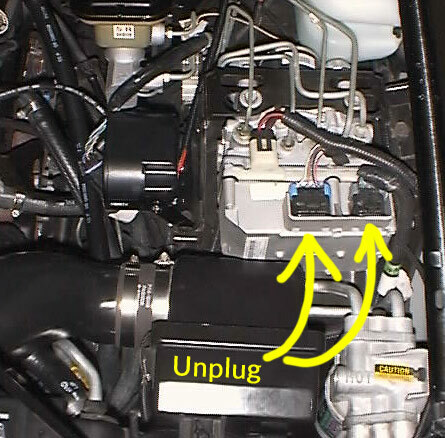 Unplug the large connectors connected to the front of the ABS unit. 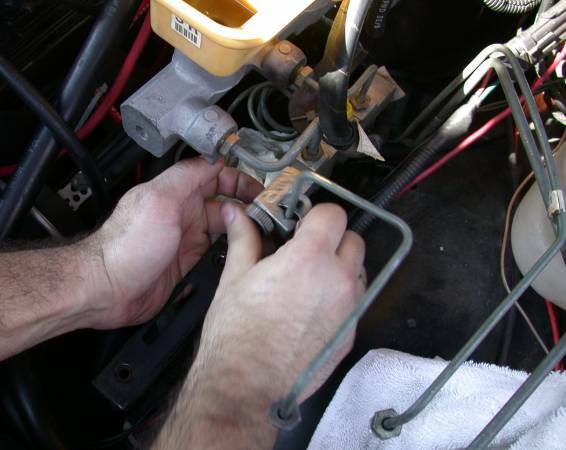 Cut or loosen the brake lines from the ABS unit. 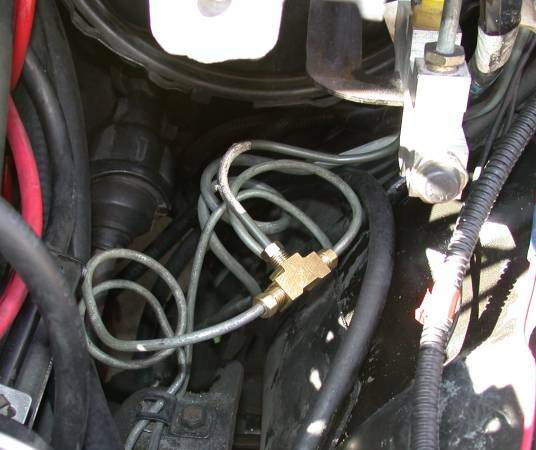 These brake lines will not be reused when deleting the abs unit. Remove the ABS unit and bracket from the engine bay. "D" Should be the largest line, going to the rear wheels. "C" and "E" are the lines for the front wheels. 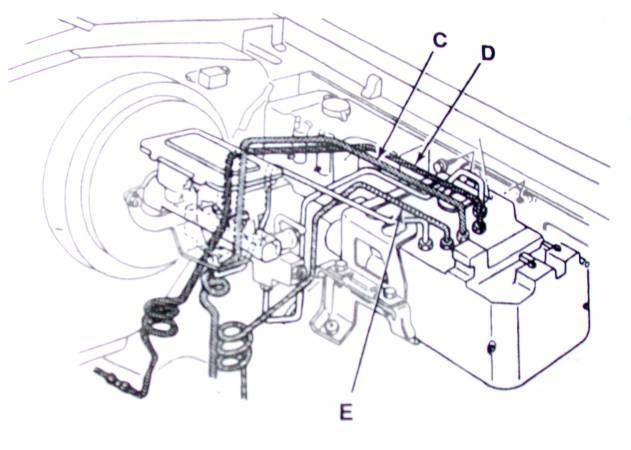 Join the 2 front brake lines together using a T-fitting. Each of the lines should connect to the T-fitting on opposing sides. 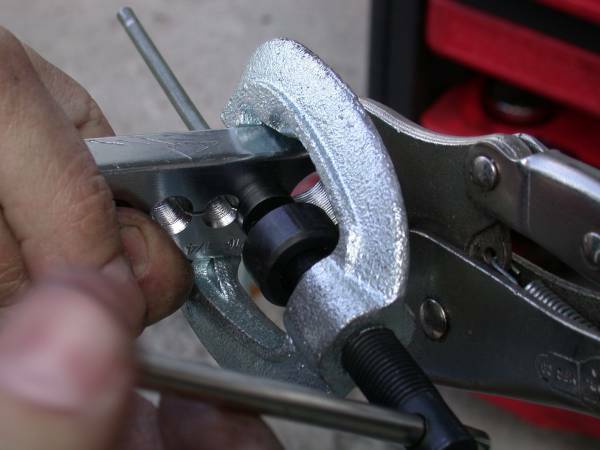 Using a short length of 1/4" brake tubing, connect the new T-fitting to the rear-most port on the bottom of the brake distribution manifold. You will have to bend, cut, and double flair the new tubing to the correct length. The line that feeds the rear brakes needs to be shortened and bent into shape. Do so now. Slide on a flare nut and Double flare the end of the rear line using your flaring tool. Connect the newly cut rear brake line to the forward bottom port on the brake distribution manifold. Bleed each wheel, starting with the furthest away from the master cylinder and getting closer. First test the system by pressing firmly on the brake pedal. Make sure the new lines and flaires can maintain high pressure without leaking. 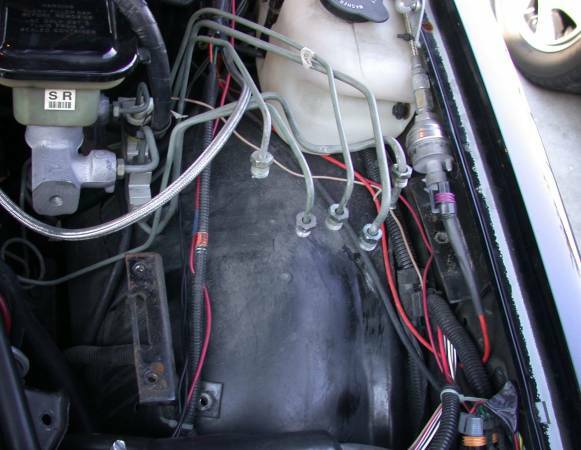 Visually inspect all the fittings and flares for leaks. Once your satisfied everything is leak free, begin testing brake functionality. Be extremely cautious and double check all connections at this point. I believe Sportmachines carry a kit that comes with everything you need for this mod. The non-ABS trucks have the junction (T) for the front brakes adjacent to the LF shock tower. As long as one is cutting and flaring, may as well put the T down where it isn't as prominent as shown in the pics. Some states that have inspections, frown on brake system modifications. Make the removal as inconspicuous as possible.